Michelle Williams is best known as a member of the second version of Destiny's Child. As a solo artist, she has recorded mostly gospel. An attempt to record secular music didn't work out. She's had success in the gospel market including this 2014 Destiny's Child reunion Say Yes. She was born July 23, 1980 in Rockford, IL. She grew up singing in church. Michelle studied criminal justice at Illinois State. But after two years, she decided to try singing as a career. After touring as a backup singer for Monica, she met Beyonce and Kelly Rowland in an Atlanta hotel lobby. And that led to Michelle joining Destiny's Child in 2001. While still a member of Destiny's Child, she released the 2002 album Heart To Yours. It was a gospel album. The single Heard A Word was written and produced by gospel music producers Buster & Shavoni. She also made her Broadway debut in the hit musical Aida. 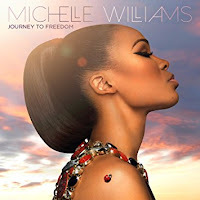 she released the 2004 CD Do You Know mostly produced by her brother Erron Williams. After Destiny's Child split up, Columbia convinced Michelle she should record secular music. But the 2008 album Unexpected didn't do well. And she left Columbia in 2010. For a while she concentrated on musical theater. And she also appeared on the British TV dance competition Strictly Come Dancing. Apparently she was recording a secular album in 2011 but it doesn't look like anything came of it. She decided to return to gospel and signed with Light Records. the 2014 album Journey to Freedom was produced by Brit Harmony Samuels. He's a protege of Rodney Jerkins and he has produced Fantasia among others. The single Say Yes was a Destiny's Child reunion. They appeared on her other albums. The song topped the gospel charts. The African groove is because Samuels is of Nigerian descent. Destiny's Child performed Say Yes on the 2015 Stellar Awards broadcast. Other guests on Journey To Freedom are Eric Dawkins, Lecrae, Tye Tribbett and Fantasia. Since then she has made some TV and stage appearances. And she has appeared at some events with a new boyfriend. But there is no word on new music. Maybe she is working on something and we don't know about it yet. She'll always be overshadowed by Beyonce. That's why gospel is a good market for her. Here's the video for Say Yes by Michelle Williams featuring Beyonce and Kelly Rowland.